This colorful online activity is a math test about subtracting numbers. 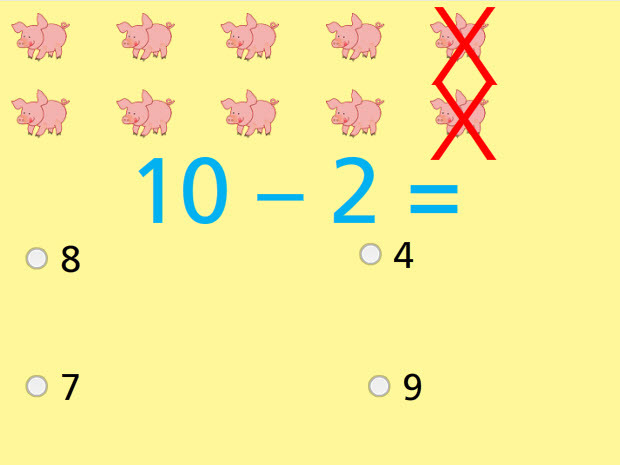 The student subtracts numbers up to 10 using pictures or by subtracting numbers. This test has ten multiple choice problems. The student can count the total number of pictures and then count the number of pictures that have been marked with an X. They should recognize that the number of unmarked pictures represents the remainder after the subtraction has been completed. Return from this Subtract with Pictures Numbers up to 10 Math Test to the Elementary Math Tests , 1st Grade Math Tests webpage, or to Math Tests.